Austrian rabbi and author; born in Prague Aug. 26, 1754; died there April 27, 1826. He was the pupil of Moses Cohen Rofe, Meïr Fischels, and Ezekiel Landau. At the age of twenty-four he became rabbi of Kojetein, a small town in Moravia. In 1780 he was appointed dayyan in his native city. Later he accepted the office of rabbi of the bet ha-midrash founded by Joachim Popper and Israel Fränkel. Fleckeles was renowned for his scholarship and oratorical gifts, and for his skill in worldly affairs. 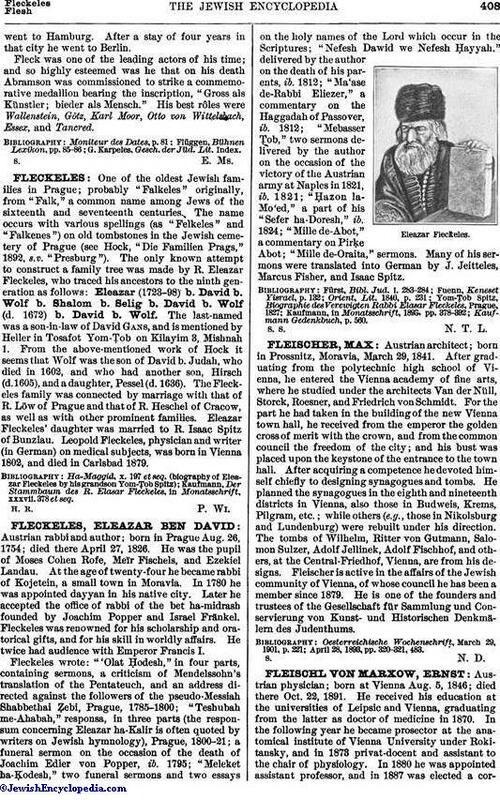 He twice had audience with Emperor Francis I.
Fleckeles wrote: "'Olat Ḥodesh," in four parts, containing sermons, a criticism of Mendelssohn's translation of the Pentateuch, and an address directed against the followers of the pseudo-Messiah Shabbethai Ẓebi, Prague, 1785-1800; "Teshubah me-Ahabah," responsa, in three parts (the responsum concerning Eleazar ha-Kalir is often quoted by writers on Jewish hymnology), Prague, 1800-21; a funeral sermon on the occasion of the death of Joachim Edler von Popper, ib. 1795; "Meleket ha-Ḳodesh," two funeral sermons and two essays on the holy names of the Lord which occur in the Scriptures; "Nefesh Dawid we Nefesh Ḥayyah," delivered by the author on the death of his parents, ib. 1812; "Ma'ase de-Rabbi Eliezer," a commentary on the Haggadah of Passover, ib. 1812; "Mebasser Tob," two sermons delivered by the author on the occasion of the victory of the Austrian army at Naples in 1821, ib. 1821; "Ḥazon la-Mo'ed," a part of his "Sefer ha-Doresh," ib. 1824; "Mille de-Abot," a commentary on Pirḳe Abot; "Mille de-Oraita," sermons. Many of his sermons were translated into German by J. Jeitteles, Marcus Fisher, and Isaac Spitz.